Srinagar: The stage is all set for PDP President Mehbooba Mufti to take over as the first woman chief minister of Jammu and Kashmir after she was unanimously declared elected as the PDP legislature party leader and nominated as the party’s CM candidate today. 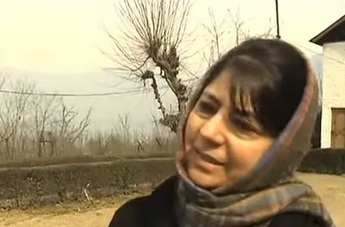 56-year-old Mehbooba was elected as the leader of PDP Legislature Party at a meeting of the senior leaders, which included MPs, MLAs and MLCs, at her residence here. Now what remains a formality before Mehbooba Mufti is sworn in as chief minister is a letter of support from the BJP.